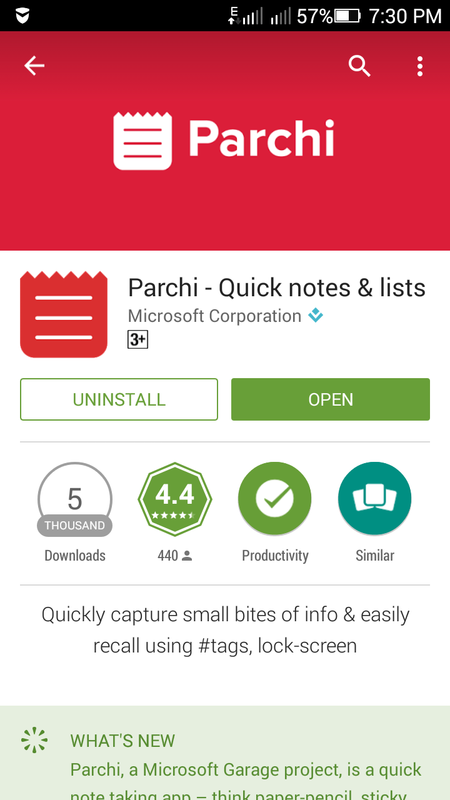 Microsoft Garage recently released its new app Parchi for Android. It is a quick, and simple note-taking app which works even with the phone locked. For those who find it time consuming to unlock their phones and search for a specific app to add a note or reminder, Parchi may well be the perfect solution. The app contains basic features of reminders, quick notes, colored notes, and backup restoration. The app is interesting because it allows the use of #hashtags to filter search. There's also a "Quick Notes" feature that allows the users to jot down notes directly from the lock screen. With this app, users can add text and pictures to a note, and even use color if they want to spice things up a bit. Additionally, users can use the share option to share notes over SMS, mail, social media and WhatsApp.of tasks as well. Parchi is a light-weighted app that covers 3.6MB in size and is compatible with Android 4.2 Jelly Bean and later. Compared to this, OneNote is approximately 10 times larger in size, and requires Android 4.1 and above. 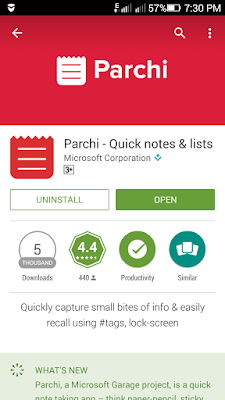 Currently, there are regional limitations for Parchi and is inaccessible in many regions across the world including India.It has been a while since Microsoft has been developing apps for Android. Few weeks ago, it released Send; an app functioning as a messenger, and an email client. As per rumors, Microsoft Garage is in the stage of developing a Dialer app as well.